100 years ago, people simply did not have dull tools. At least, not as we know them today. It has become a standard to buy new instead of fixing what we have, a practise which has led to cheaper and lower quality, perpetuating the need to continue buying. While it would be preposterous to claim that certain things, like chisels and gouges, plane irons and drawknives are tossed when they lose their edge, others such as saws and drill bits are rarely saved. Yet, with only a few simple hand tools, I can re-sharpen almost any tool I own. By that alone, it becomes less of a matter of availability, but more a lack of knowledge or care to put forth the time to repair what we already have. 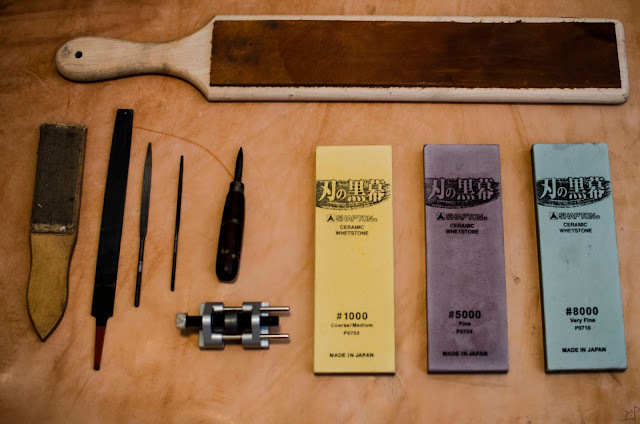 It is with the intent to change that mentality that I have decided to share the process I use for sharpening my hand tools, of which most are at least twice as old as I am (and work better than most of the newly made ones at that). 10 simple tools. That is it. With these (and a few have very specific purposes which are only needed for one or two jobs), I can sharpen anything I own. Yes, certain things will make sharpening easier, such as electric grinders and belt sanders, those fancy gadgets and useless gizmos, but they are not necessary. First up are the files. I only really need the three (and really only need two). The farthest left is a flat, medium cut Nicholson (from the manufacturer online, NOT the hardware store). I use it for establishing rough edges on things a stone will take too long to fix. More specifically, however, I use it to prepare the edge of a card scraper before burnishing. 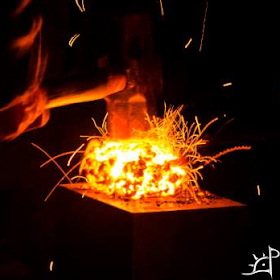 In a pinch, it can also be used on splitting mauls and wedges, and to re-face hammer heads. The second file a smaller half round file, but with a tapered point. I also use it for card scrapers, but on curved surfaces where a flat file will not do. The flat side is perfect for taking care of most drill, auger, countersink, and assorted other bits for drills and braces. Last is a triangular needle file, which I use exclusively for saws. The slim profile allows for sharpening the angle of the tooth without reverse-sharpening the adjacent tooth. In the same category (far left) is a file card. While this does not technically sharpen anything, it keeps the file teeth clean. To the right of the files lies a burnishing tool. I use this solely for card scrapers, although it can also be used creatively for other things which I will not delve into now. It is a double-half round piece of hardened steel that tapers to a fine point. This is used on a square edge of a card scraper to roll a burr, which does the actual cutting. The curves and taper allow for raising a bur on tightly curved surfaces, and the hardness prevents it from losing its smooth surfaces. An alternative to a burnishing tool is the back of a low number (small) gouge. 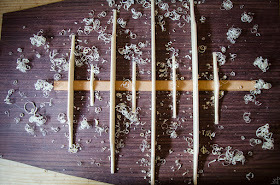 It is hard enough to take the edge of the card scraper, but is a little trickier to use on a French curve. Below the burnishing tool is a honing guide. This is not strictly necessary, but helps maintain consistency with edge geometry. It was very cheap for what it is worth (around $12) and will last a lifetime. There are two sets of jaws, one to hold chisels, and the other for plane irons. It keeps a constant angle of the blade and helps with minimizing roll side to side, and thus perpendicular edge. Next are the water stones. Or you can use oil stones, diamond stones, whatever suits your fancy. I also have a few low grit stones for really aggressive shaping, but the file may also work for that depending on what it is you will be sharpening. To repair an edge or hone it back to its cutting sharpness, I start at 1000# until a consistent, straight edge is established. I then move to 5000# and 8000# respectively. These are Shapton ceramic water stones, and wear extremely slowly and evenly, as well as do not need to be soaked for long periods of time before use. The stones are what I use most often, sharpening chisels, gouges, plane irons, draw knives, regular knives, spoke shaves, etc. Lastly is a leather strop. Mine happens to be glued to a piece of wood, but it does not need to be. Half the time I just use my shop apron and it does the job. On a board, however, it is easier to maintain consistency as well as dedicate a surface to various polishing compounds. Jeweller's rouge works well with the leather fibres, but I use 3-in-1 oil for this one. A strop does not sharpen, but rather hones an edge and helps remove a burr. It also polishes slightly, which for certain blade types is important for cutting ability.